Ben is an excellent goaltender who joins the Tommies after a five year junior career that started and ended in Woodstock. During his his Major Junior career he played in Shawinigan and Rimouski. This past season he came back to Woodstock and led them to the MJAHL final where they lost to Yarmouth. 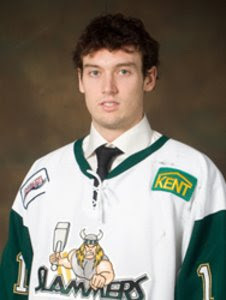 Ben was drafted into the QMJHL by Shawinigan in the 9th round (140) and was traded to Rimouski in December 2006. Ben is listed at 6'0 198 lbs and would seem to be the heir apparent as Matt Davis enters his final year with the Tommies. Ben should certainly be able to give Davis a few more minutes off this season (not that Matt appeared to need it last year) while he learns the AUS game. Welcome to the Tommies, Ben, and Good Luck! As a Tommies fan that was converted to a Slammers fan this past season, I am really excited to see Ben play for the Tommies. I hope to make it down to see them play this season. Best of luck Ben! We'll miss you!!!! And best wishes to the Tommies! Go get 'em boys!! !